We've been celebrating Hawaii with our own version of a luau. We've been cooking up lau lau, pipikailua beef, and chicken cafreal. Yeah, that last one isn't Hawaiian, but it is one of our Tabla favorites, and at least it is tropical. 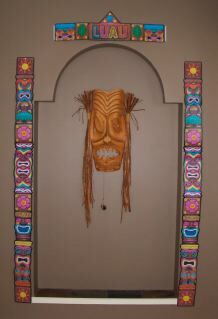 For more on our luau, check out the Kaleberg Luau page. 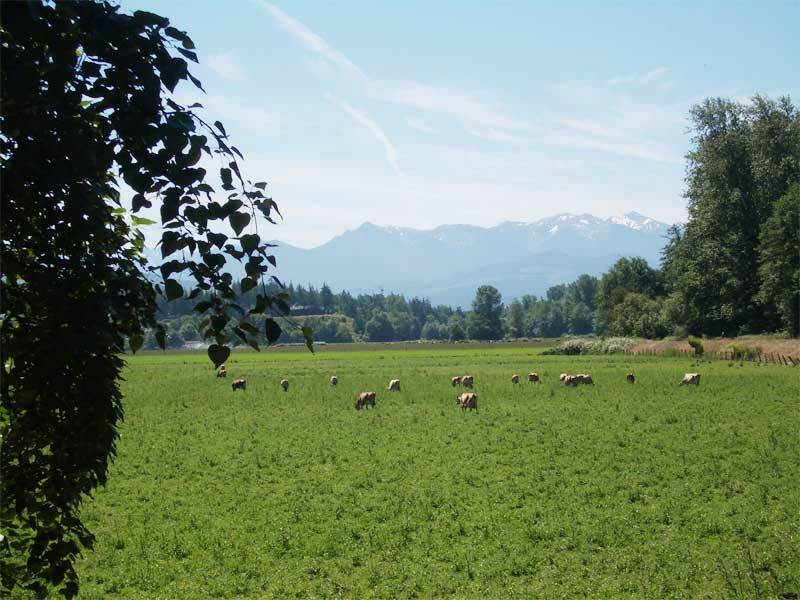 We get a number of questions from people trying to plan trips to the North Olympic Peninsula and not sure of how far it is from one attraction to another. 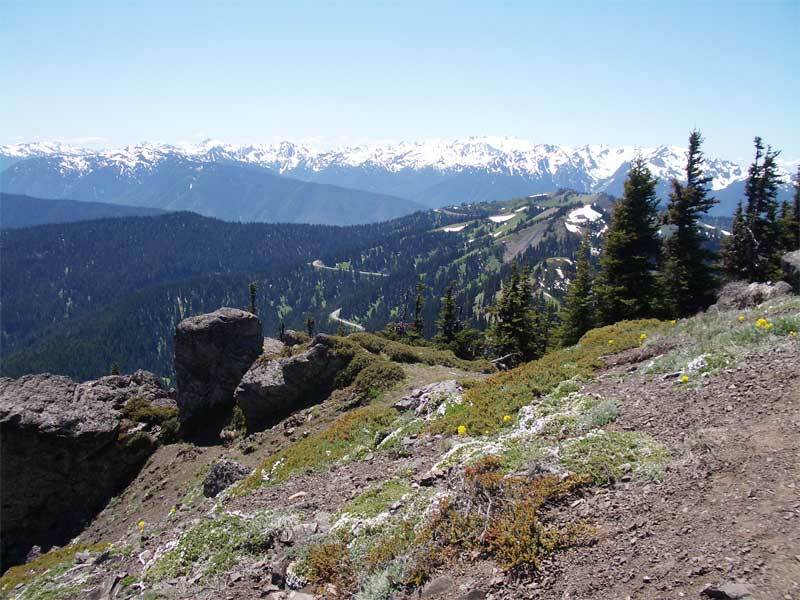 Olympic National Park is a big park comprising the central part of the peninsula and much of the Pacific Coast. There are no roads through the middle of the park, and there is no long coastal road to follow. This makes planning a trip a bit tricky. Even getting from La Push to Rialto Beach, a distance of perhaps a mile or two along the coast requires driving inland to the bridge at Mora, so the total drive is perhaps 11 miles and takes about 25 minutes. Hurricane Ridge is not very far from the Hoh Ranger Station as the raven flies, but it is several hours drive. 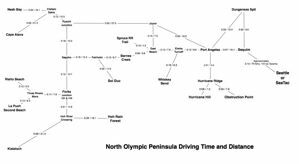 To help the many visitors to the park and surrounding areas, we offer this Kaleberg Driving Time and Distance Map of the North Olympic Peninsula. It is based on the distances as computed by Google Maps, but we have used our own estimated driving times rather than the Google estimates. Google has some peculiar ideas on how fast one can drive on various park roads, and they still have the Hurricane Hill Trail from Whiskey Bend to Hurricane Hill as an automobile road! We're sure that was a trail, even before Google was founded. We've also taken some liberties in defining certain intermediate locations which do not appear on any map. In general, things like Elwha Turnoff and Hoh River Crossing are not marked as such on any other map you might find, but are useful junction points linking roads and turnoffs, just what you want for planning your drive. 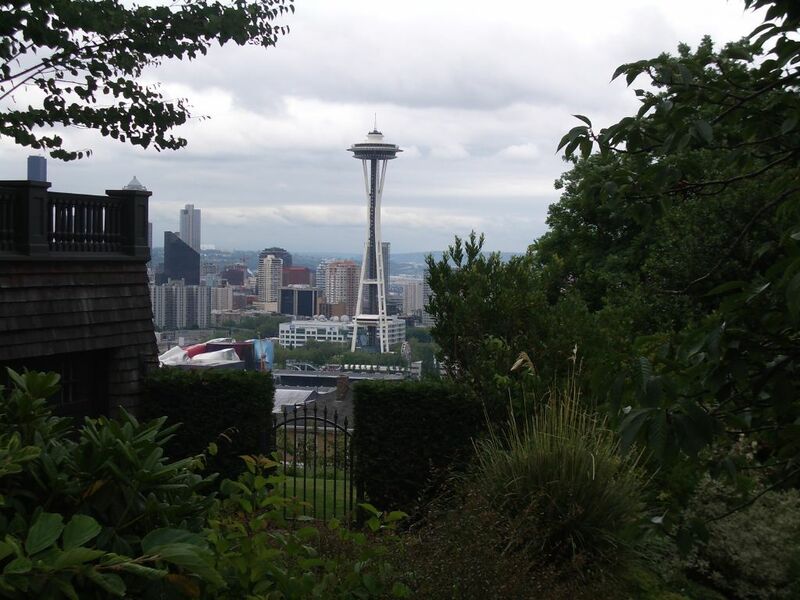 We we in Seattle for a quick overnight trip, and this time, we explored a new neighborhood, at least for us, Queen Anne Hill. Seattle Center was our usual turning point on our urban wanderings, but this time we wandered past the stadium and up the hill. It was a climb worthy of San Francisco as we passed a series of increasingly upmarket apartment buildings and condos. As we approached the oversized antenna on the top, we found a charming little staircase through an Northwestern garden that lead to another level, a huge parking lot, an apartment building, and yet another huge radio tower. The walk down was spectacular, with Seattle's version of the painted ladies, perhaps a quarter of them being remodeled, and some spectacular views of the city and the sound. We made our way down to the city below, following the back streets and taking little staircases when we could. We staggered into Belltown, and collapsed at a recently opened wine bar, The Local Vine. It was a pretty place, with big glass windows, high ceilings and a fantastic wine collection as you can see in the photo to the right. We were quite impressed with the champagnes. 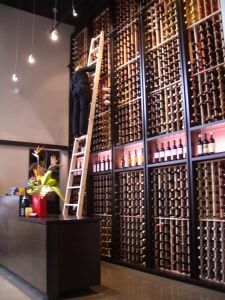 The rest of the extensive wine list looked fascinating, and the food menu, mostly small plates, looked promising. Even better, they serve all afternoon. This might be a great place for a pick me up. The brandy is about 96 proof so around 48% alc by volume and made by macerating young Douglas Fir buds in unaged grape brandy, distilling the buds, then infusing more buds in the Doug Fir brandy to retain color (everything comes out of the still clear). We sell it here at the distillery as well as some Washington State Liquor stores and a handful of other states. The Seattle area stores do a great job keeping our products on their shelves. If you are interested in finding this product in Washington State, click here. 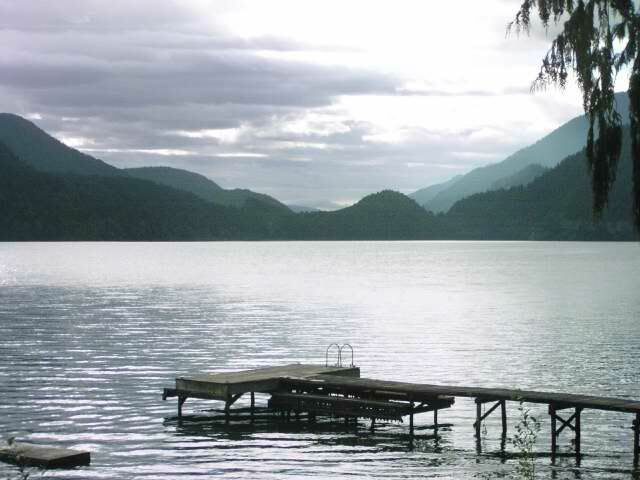 Since we've been gawking at the Hurricane Ridge webcam rainbow, we should also note that there was some amazing light at Lake Crescent this morning, as you can see in this webcam image. 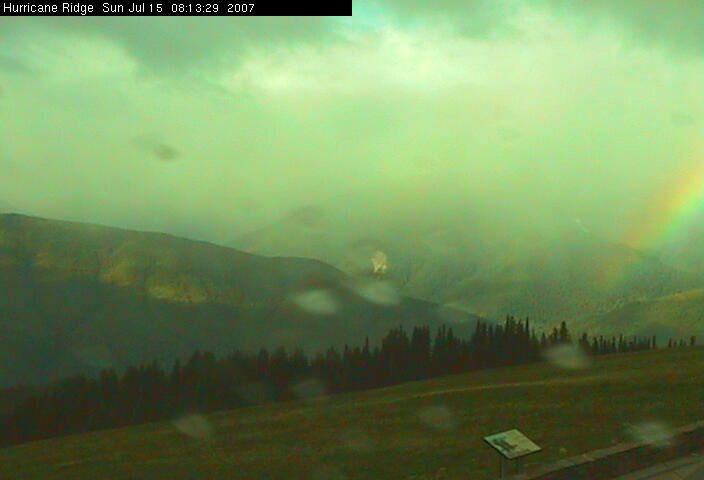 We often check the Hurricane Ridge web camera to get a sense of what the weather is doing in the high country. This morning there was a pleasant surprise. Check out the rainbow towards the right of the image. This might not make for the best hiking weather, but it sure does brighten the day. For some more interesting webcam images, check out our webcam movie page. This year's death cake was special. Instead of good old fashioned Baker's chocolate, we used 100% Plantations Arriba chocolate from eChocolates.com. Hands down, this was the best death cake ever! Of course, some of the difference may have resulted from our using Dungeness Valley Creamery milk and Dry Creek Farm eggs. If you study our recipe, you'll see that an important component of the cake is a chocolate pudding made of milk, brown sugar, egg yolk and chocolate. We used a full bar and a bit more of a Plantations bar (over 4 oz), and the chocolate flavor had a magnificent bitter note that was missing in earlier death cakes. 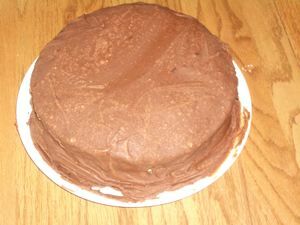 We also used a bar of chocolate for the fudge Cockaigne icing. It didn't dissolve all that well. There was a bit of chocolate residue that formed while we brought the batch to the soft ball stage, but the icing was creamier and richer than usual. The death cake can be a challenge to make, but the proof is in the eating. As far as we Kalebergs are concerned, this is the best chocolate cake ever. We were in the Dungeness Valley today and decided to stretch our legs on the Dungeness Dike Trail. Those cows are the Jerseys at the Dungeness Valley Creamery. Those mountains in the distance are the Olympic range. The trail along the Dungeness River dike is easy going, and there are several paths down to the river itself, but we spent most of our time admiring the view. 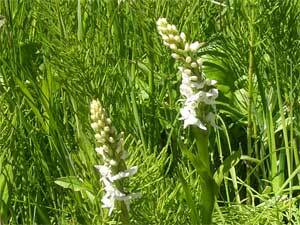 07/04 - Did we mention bog orchids? Even if you don't climb the Switchback Trail all the way up to Klahane Ridge, check out the little waterfall near the trailhead. 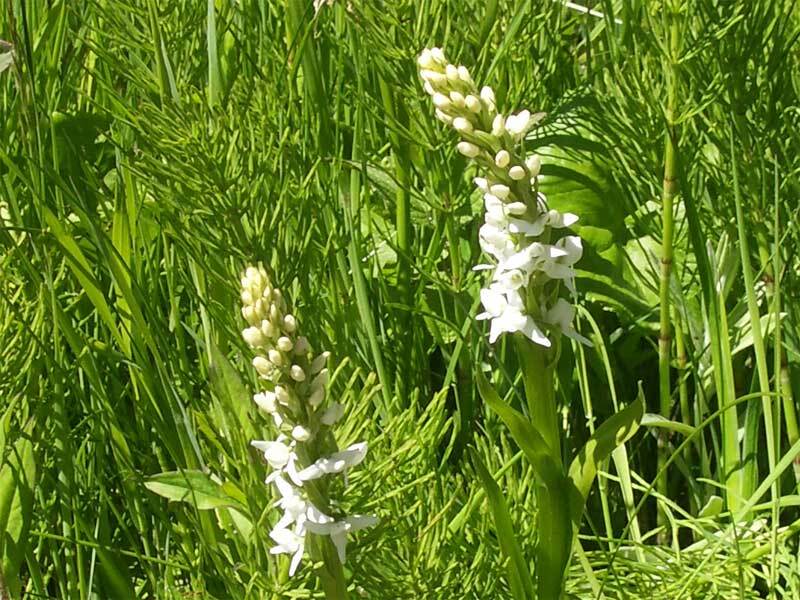 If you notice a wonderful sweet smell, it is probably the bog orchids. They are starting to bloom as you can see, and the scent is fantastic. 07/04 - Did we mention Klahane Ridge? Did we mention Klahane Ridge? 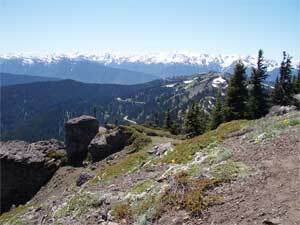 The trail is clear to the ridge, and the view is spectacular. The phlox is in bloom, and the alpine gardens are starting to bloom. It's a good, solid 1500' (or so) climb, but the views and scenery are worth it. There have been reports of an aggressive male mountain goat, and on our latest climb two hikers reported seeing a female mountain goat grazing out in one of the fields, but we didn't get to see her.